There is something special about homemade jam. The smell of fruit cooking is sweet and delicious and the aroma truly takes me back to my grandmother’s kitchen. As someone who lived through The Great Depression, my grandmother always served bread with dinner as an inexpensive filler. It was simple sandwich bread–we called it “jelly bread”–and her homemade jam made it taste like a million bucks! For a few extra jam-making tips, click on this link to my Classic Strawberry Jam recipe. The aroma as the fruit cooks is divine and the process is not complicated. Simply follow the easy steps. Place the peaches and lemon juice into a large pot. At this point, I like to take my potato masher and mash the peaches a bit. Measure the sugar into a separate bowl and set aside. Stir the package of pectin into the peaches and add the butter. 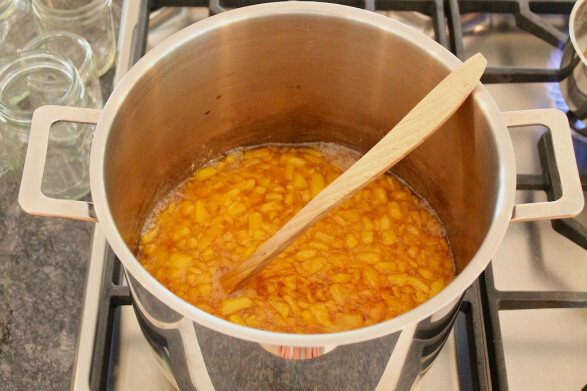 Stirring frequently, bring the peach mixture to a full rolling boil (a boil that does not stop bubbling when stirred), then add the sugar. Stir to fully incorporate. Return the mixture to a full, rolling boil and boil for exactly 1 minute, stirring constantly. Skim any foam from the surface. Wipe the rims of the jars with a clean cloth. Place the heated lids (lids that have been placed in simmering water for at least a minute) on the jars and tighten the bands. Place the jars in a canner and process (gently boil) for 10 minutes (water should cover the jars by an inch or two–add boiling water, if necessary), then remove the jars from the canner. Cool completely before storing. Make certain all lids have sealed properly before storing. If the lid springs back when pressed in the middle, it is not sealed and should be stored in the refrigerator. If you prefer to skip the processing step, simply store your jam in the refrigerator or freeze. If you choose a low sugar or liquid pectin, consult the directions on the package as adjustments would need to be made. This looks so amazing! This might have to be my first foray into making jam! What is the reason for the butter? Good question, Ani! The small amount of butter actually helps to reduce the foam on the surface. You may omit, if desired. There’s something warm and comforting about seeing your homemade canned products lined up in your pantry. Your jam looks not only beautiful but delicious! Thank you, Jackie, and I agree. I always feel satisfied and accomplished after putting away the jars! Hi Ann, Just saw this post and was wondering how long will the jam store for? Is there a way to make this recipe for someone who is diabetic? My father-in law loves peaches and I know he would love this. thank you. There is a low-sugar Sure-Jell that is available. I have not used this but have heard good things about it. You would simply need to follow the directions on the package. I have seen other recipes using chia seeds as a thickener, but have not experimented with that yet. If you have any other questions, please let me know…I hope this helps! …and I almost forgot to mention, when canned and sealed, the jam will keep in a cool, dark place for at least a year. Refrigerated, it will keep for quite a number of weeks…several months if unopened. I’m thinking of tossing in a split and scraped vanilla bean pod and a splash of Maker’s Mark bourbon. Whiskey Peach Jam just sounds good. I love that idea, Kim! I cant wait till its done! There is probably an amazing aroma wafting through your kitchen by now, Claudia! I can’t wait to hear how you make out with the jam and the shrimp! 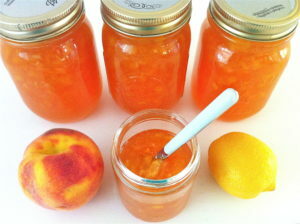 The jam is amazing, anyone that loves peach needs to make this asap thank you thank you thank you… I love it!!!!! your a gem for sharing! …and you are a gem for leaving such delightful feedback, Claudia! So glad you are pleased with it! It’s always a treat to see a message from you, Beverley! Thanks for the sweet comment and love you right back!! Hello from Manitoba…I am not fond of canning (as yet),can I follow the steps in making this jam but keep in the fridge and use it quickly?you make it look mouth wateringly delicious that I want to try making some..Thank you!!! Hello from Pennsylvania and absolutely to keeping the jam in the fridge, Tara. I have actually stored unopened, unprocessed jars in my fridge for quite a while as a test, and the taste and color kept very well. Even the opened jars last for quite a few weeks if you make a habit of only using clean utensils to dip into the jar, etc. Hope that helps and that you have a chance to try! 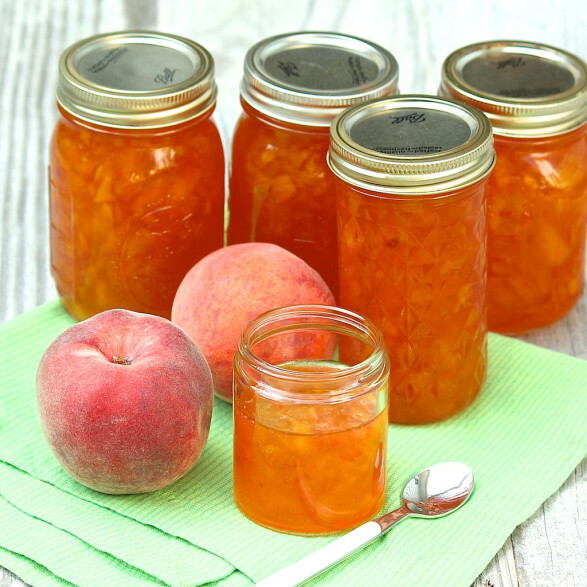 If you pour your boiling peaches into the jars immediately, you don’t need the water processing. They will seal and last for at least a year. I’ve canned this way for 40 years. That’s the way I learned from my grandmother, Patti. The only reason I don’t suggest it here is because the method doesn’t conform to current safety guidelines. Thanks for taking the time to mention! So glad you like it, Cyndy! An accurate amount of fruit is the key to the jam setting up properly, which is why I specify weight instead of cups in the ingredient list. For those who don’t have a kitchen scale–which is probably a lot of people!–I recommend weighing the peaches at the store. Hope this helps for the next time! Hi Grace, I’ve only used the powdered pectin. I would look on the package to see if there’s an equivalent for the powdered option. My guess it that there will be and that it could be used instead. Can you use the liquid pectin? If so, how much? Hi Janet, I have never used the liquid version, so I did a little investigating. The more I read, the more I realized that the answer will vary based on brand, whether the pectin is instant, low sugar, etc. My recommendation would be to look at the package and see if it offers a clear substitute. 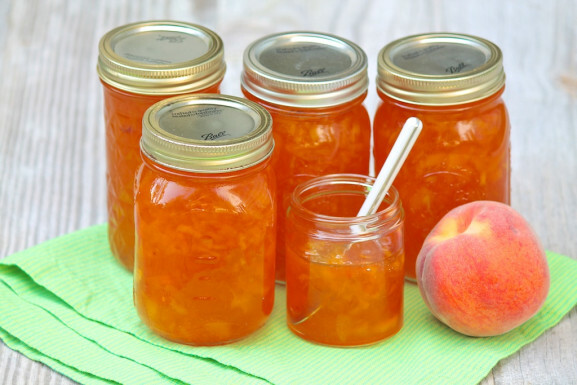 Also, I believe liquid pectin is usually added later in the cooking process than dry, and it may not produce as good of a set when used with low-pectin fruits–and peaches are low in pectin. I hope this is somewhat helpful! Easy and delicious. I used a lesser amount of sugar then the recipe. The recipe yields seven cups of jam, so you could use seven 8-ounce jars or 3 pint jars plus one 8-ounce jar. Hi Candace, This jam does thicken up nicely. The photo was taken when it was fresh out of the pot and still a bit runny. I’ve made this recipe many times and, if you follow the measurements, cooking time, etc., you shouldn’t need more pectin to achieve the desired result. Enjoy! I didn’t weigh my peaches before I peeled and cut them up. Do you know how many cups of peaches you got out of 6 lbs. of peaches? I want the proportions of sugar, pectin and lemon juice to peaches be correct. For an option to the weighted measurement, 3 pounds of fresh peaches will yield approximately 4 to 4-1/2 cups of finely diced, peeled and pitted peaches. So if you begin with 6 pounds, you’ll get about 8 to 9 cups. Hope that helps, Sandra! This is the classic recipe that I was looking for for me and My Sister to do during the weekend, we are probably doing two baskets of peaches. But the real question is, is it thick? My other Sister made hers, didn’t use pectin and you can’t even keep it on the knife to spread, I always used pectin, I thought that it was important to keep the color and for it to thicken the preserves? We are also skipping the water bath and using the wax, but will still seal with a simmered lid in water and the ring. This does have a nice, thick consistency, Linda. The photograph was taken right after making that particular batch, and it definitely thickens as it sits over the first week or so. The color also stays quite nice, and I do think the pectin helps in both regards. I hope that answers your questions and that you have a fun day canning with your sister! Hi. I was wondering , could I use bottled lemon juice for this recipe ? That would be fine, Lisa! This is the first time I’ve ever tried making jam. If my jars do not seal, may I freeze them in the jars? And for how long will they be good in the freezer? Hi Stevie, Your jars will likely seal, but if they don’t, you can absolutely freeze the jam. Because the jam will expand when it freezes, you need to have enough headspace, or room under the lid. If you’re not sure that you have enough, you could remove a small amount to be sure. Good luck…and enjoy! Hi Kelly, Depending on the type of powdered pectin you purchased, the proportions will vary. There should be a conversion on the label of your jar. For Classic Pectin – 6 tablespoons equal a box. For Lo/No Sugar Pectin – 3 tablespoons equal a box. For Instant – 5 tablespoons equals a packet. I got that information from Ball, so it should be accurate. Good luck and enjoy the jam! Hi Christopher, The tiny bit of butter is an optional way to reduce foaming and is considered safe according to the Ball canning experts. I also just double-checked to make sure the food safety guidelines haven’t changed, and I don’t believe they have. That said, it is not safe to can just butter. If you have further information on this, please feel free to share it. I saw below that you cannot use liquid pectin. If I have powdered pectin for “low sugar” recipes, how much should I use? (Ball low sugar pectin, it comes in a container rather than a box). I tried this recipe with “1 box of sure-jell” pectin, but it didn’t work. It was liquid pectin and from reading the comments, it seems that you box was powdered and my box was liquid. Please help, it never set. Hi Dena, I’m sorry you used the liquid pectin and that the jam didn’t set. I’ve only ever used powdered pectin, and there are adjustments that would need to be made when using liquid or low-sugar formulations. I’ve attached a more obvious note to the recipe to hopefully eliminate any further confusion. You may find that the jam firms up over the next week or two and that it still tastes quite good. Please let me know if you have any more questions! Thanks Ann. I’m going out to buy the regular powdered pectin that you listed. The liquid pectin calls for much more sugar and although I do not want to eliminate or drastically lower the sugar, I just want to use less. I want more of the peach flavor to come through. This is the only recipe that calls for the proportions I am looking for. I am trying again today! Thanks for the follow up and good luck. I think you’ll find that the peach flavor really shines with this recipe, and I hope you’ll be enjoying it all winter long! Could you please let me know how many jars are needed for each recipe. Hi Sally, The yield is 7 cups, so you could use 7 (8-ounce) jars or 3 pint-size jars plus an 8-ounce jar.